We are glad to announce Healing Sessions at your Residence. 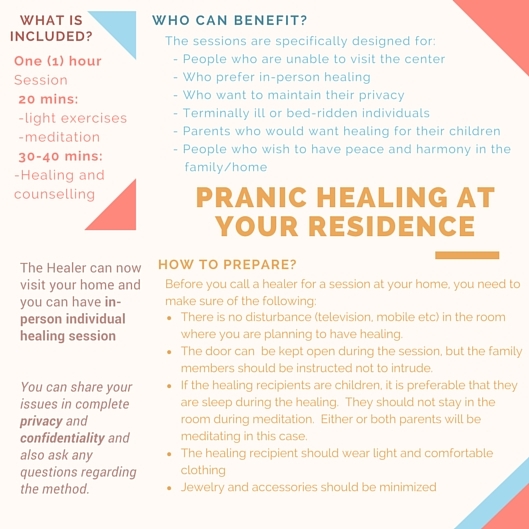 The Healer can now visit your home and you can have in-person individual healing session in the location you are comfortable and familiar with. You can share your issues in complete privacy and confidentiality and also ask any questions regarding the method. ﻿There is no disturbance (television, mobile etc) in the room where you are planning to have healing. The door can be kept open during the session, but the family members should be instructed not to intrude. If the healing recipients are children, it is preferable that they are sleep during the healing. They should not stay in the room during meditation. Either or both parents will be meditating in this case. How can I Schedule a Session? 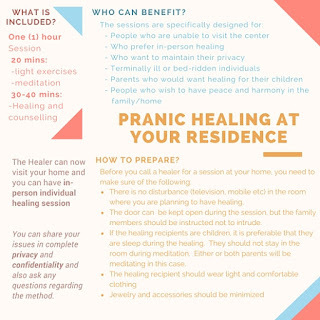 You can send an email to thevitalitycafe@gmail.com mentioning the request for healing session at home, the location of your residence and relevant questions. We will contact you back with the availability of the healer in your area.